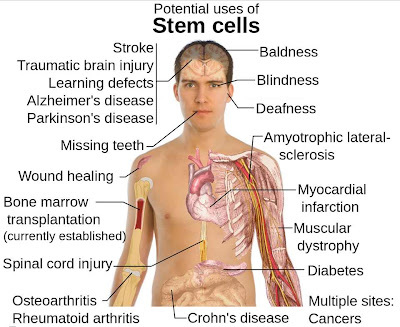 Stem cells can be used to transform it to any human cell type under lab conditions. As such, it has great potential to repair and even replace diseased cells in organs and tissues. It may even help in its regeneration. Latest research show that stem cells can be used for the treatment of Type 1 diabetes. Type 1 diabetes is caused by the body's own immune system attacking its pancreatic islet beta cells and requires daily injections of insulin to regulate the patient's blood glucose levels. A new method described in BioMed Central's open access journal BMC Medicine uses stem cells from cord blood to re-educate a diabetic's own T cells and consequently restart pancreatic function reducing the need for insulin. Cord blood or Umbilical cord blood is blood that remains in the placenta and in the attached umbilical cord after childbirth. Cord blood is collected because it contains stem cells which can be used to treat diseases and hematopoietic (blood related) and genetic disorders. Stem Cell Educator therapy slowly passes lymphocytes separated from a patient's blood over immobilized cord blood stem cells (CBSC) from healthy donors. After two to three hours in the device the re-educated lymphocytes are returned to the patient. The progress of the patients was checked at 4, 12, 24 and 40 weeks after therapy. Insulin is a hormone that stops the use of fat as an energy source. It regulates the carbohydrate and fat metabolism of the body and cause cells in the liver, muscle and fat tissue to take glucose from the blood. Glucose when unregulated can be toxic. At low levels the body begins to break down the glycogen stored in the liver and muscles into glucose which is used as an energy source. Patients with type 1 diabetes depend on external insulin for their survival because the hormone is no longer produced internally. C-peptide is a protein fragment made as a by-product of insulin manufacture and can be used to determine how well beta cells are working. By 12 weeks after treatment all the patients who received the therapy had improved levels of C –peptide. This continued to improve at 24 weeks and was maintained to the end of the study. This meant that the daily dose of insulin required to maintain their blood glucose levels could be reduced. In accordance with these results the glycated hemoglobin (HbA1C) indicator of long term glucose control also dropped for people receiving the treatment, but not the control group. Dr Yong Zhao, from University of Illinois at Chicago, who led the multi-centre research, explained, "We also saw an improved autoimmune control in these patients. Stem Cell Educator therapy increased the percentage of regulatory T lymphocytes in the blood of people in the treatment group. Other markers of immune function, such as TGF-beta1 also improved. Our results suggest that it is this improvement in autoimmune control, mediated by the autoimmune regulator AIRE in the CBSC, which allows the pancreatic islet beta cells to recover."